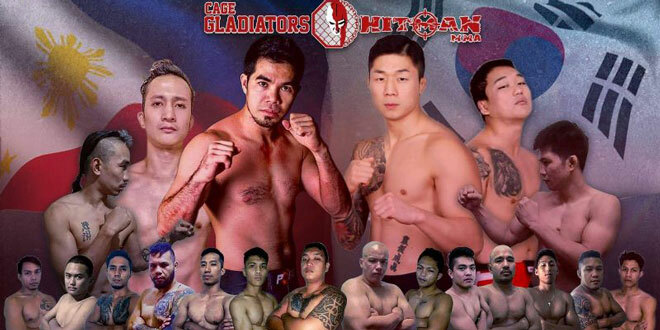 With the aim of raising the level of competition further in the Philippine mixed martial arts (MMA) scene, Laurence Canavan’s Cage Gladiators and Burn Soriano’s Hitman MMA have assembled an all-star cast for the much-anticipated Fight Night III event slated on April 14 at the Sky Dome in SM North Edsa. The third installment of the Fight Night series will feature Mumma Fight Club’s Jeffrey “Hitman” Biron headlining the main event as he goes up against Extreme Combat’s Kim Jae Woong in a three-round featherweight contest. In the co-main bout, Sprawl MMA’s Miguel Alo battles Extreme Combat’s Min Hyeok Lee in the lightweight division. “It’s the third Fight Night. This is very exciting kasi ‘yung maglalaban is Korea versus Philippines. This is the first time that we invited the best of the Korean fighters para pumunta at lumaban sa event dito,” said Soriano during “Usapang Sports” of the Tabloid Organization in Philippine Sports (Tops) on Thursday at the National Press Club (NPC). Opening the Fight Night series to foreign fighters was a concept that has been planned for a long time now; seeing it come into fruition as Canavan and Soriano, excited for the upcoming 10-bout slate, both expect a great showcase from top-notch local fighters. “Siguro it’s in our traces already, way, way back in the days of our hero Lapu-Lapu. Naniniwala ako sa mga Pinoy na may knockout power talaga, ‘yun talaga ang gift nila,” said Soriano. Canavan and Soriano talked about the partnership’s early beginnings in detail, and how their endeavor has consistently delivered on its primary goals such as grooming local MMA talents for bigger promotions, providing means for the underprivileged fighters, and raising the bar in local MMA. “I believe in giving back to the community. I’ve done a lot of programs for the poor children like feeding programs, but one of my passions is really MMA. When I found out about the fighters here, and I started to take a closer look at the fighters, we really have a deep talent pool in this country for MMA. Eventually, I found out that there’s no assistance for them, so I formed a non-profit organization,” Canavan said. “Pinaka magagawa namin ngayon is to support the up-and-coming fighters. Tapos gumagawa kami ng palaro, inaayos namin, kino-compensate namin sila ng maayos. We make sure na safe sila, may mga taga-medical, lahat. At saka may mga programs kami na tumutulong kami sa mga nangangailangan para maiwas sila sa mga bisyo, through MMA sports,” added Soriano. Fight Night III is the manifestation of such vision, and both men behind the partnership can’t wait for another action-packed event.